Foreign lawyers are poised to poach international litigants and unseat London as the pre-eminent global centre for dispute resolution under the cover of Brexit, according to the Lord Chief Justice. 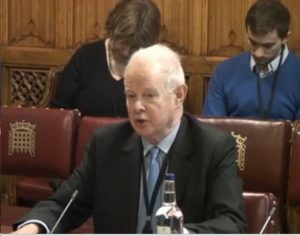 Giving evidence to the House of Lords constitution committee, Lord Thomas of Cwmgiedd also said the Lord Chancellor, Liz Truss, was “absolutely and utterly wrong” in her view that she should not condemn the media for calling judges “enemies of the people” during last year’s article 50 legal battle in the High Court. During that case, he had consulted the police for advice on protection after the claimant suffered death threats, the judge revealed. He also noted a decline in mediation in family cases, which he attributed to the absence of lawyers, leading to parties relying more heavily on judges. In a notably less restrained tone than previously – the Lord Chief Justice will step down later this year – Lord Thomas also identified critical problems with the functioning of the judiciary and hammered the Ministry of Justice for announcing in error a change in the way courts handled pre-recorded evidence. “They say ‘OK, you shouldn’t really use English law any more; it’s all vague and uncertain and it will be affected by Brexit, why don’t you use some of our laws?’. Brexit was an “extreme worry” and a “massive topic” with far-reaching consequences, Lord Thomas said: “I believe it is likely to come to dominate everything… the importance of the legal sector to the British economy is very considerable and we have a fight on our hands”. Another consequence of Brexit causing the judiciary a headache was the repatriation of the law from the European Union “including… dealing with the position of the courts when there is no recourse to Luxembourg”, he said. He added that during the Brexit case, when the claimant was threatened, “it’s the only time in the whole of my judicial career that I have had to ask for the police to give us a measure of advice and protection in relation to the emotions that were being stirred up”. He revealed that circuit judges had been so concerned during the case that they wrote to the Lord Chancellor, complaining that litigants-in-person were telling them “you’re an enemy of the people”. The Lord Chief Justice criticised the Ministry of Justice for labouring under a “serious misapprehension” this week when it announced the rollout of a scheme to allow adult victims of sexual abuse to give pre-recorded evidence in court. The MoJ had “misunderstood completely”, because in fact the judges intended only to rollout the pre-recording of children’s evidence, after having piloted it, and at the same time to begin a pilot to test the scheme for adults. The judiciary had “fought” the ministry for 16 years to bring the pre-recording of children’s evidence into effect, he explained. Resourcing was a key challenge for the judiciary, the Lord Chief Justice said. Mounting problems included a rising volume of work in the family court, in particular in relation to care proceedings. “The work is increasing at such a rate that the courts have reached saturation point,” he said. Restrictions in the availability of legal aid was causing problems in the area of divorce, in particular the children and financial aspects. There was a decline in mediation, with more disputes coming back to the court. The biggest challenge was the large number of immigration and asylum appeals in the system, he said. There were currently 618 cases before the Court of Appeal. There were similar problems in tribunals. “The volume of immigration work, the procedural aspects of it, is an extremely serious problem,” he concluded.